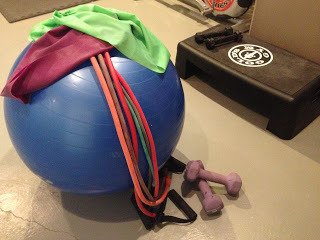 Working out…such a broad topic! What’s your choice of fun (don’t scowl at “fun”)? That’s what I want to address today. Fun. Is exercise fun for you? Has it EVER been fun for you? The majority of people who ask me exercise questions think I’m silly when I say that I enjoy working out. Why can’t exercise be fun? I think it should be and needs to be for people to stick to it for the rest of their lives. Has it always been fun for me? No. Believe it or not, I used to lay on the couch and eat potato chips everyday after school when I was in Jr. high. I did not want to do anything else for a while. Then I tried tennis at the end of 8th grade. I enjoyed it and my parents “ran with it” (ha they love to run) because they wanted me to get off my booty! Long story short, I started to enjoy exercise….but only after having to go to conditioning and playing tennis for at least a year…maybe 2. That freshmen year of conditioning was so HARD. Our coach was very tough on us and I had never worked my body that hard before. I did sports before. I did track in 7th grade and went to one, yes one, cross country practice in 8th grade (said forget this!). But for 4 consecutive years I exercised an average of 6 days a week. Resting in the off season didn’t happen much. That was the time to practice and fine-tune my game. 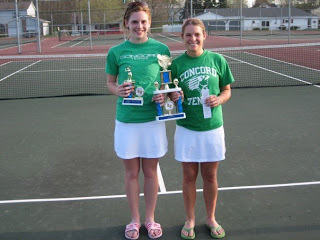 Here I am with my best “tennis friend” Ellen. We won some tournament. After senior year, when I finished tennis, something crazy happened to me. I couldn’t sleep if I didn’t exercise. It became so engrained with my normal activity that I laid in bed awake at night if I hadn’t exercised that day. So began my journey of finding something I enjoyed outside of a sports team. Something I could do without a partner and not be tennis. TURBO JAM. CHALEAN EXTREME. TURBO FIRE. INSANITY. REV ABS. 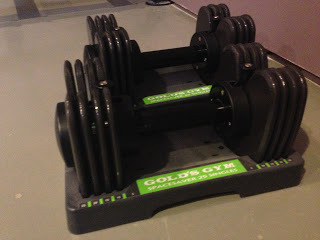 I INVESTED in some great weights. I can go from 5 lbs to 25 lbs and half sizes in between. Wonderful for saving space and it’s cheaper than buying each set of weights individually. BANDS. These are fantastic because they can replace weights in your workouts. They are also cheaper than weights. I have bands that are equivalent to 3 lbs up to 50 lbs. STEPPER. The step to the right is great for a host of things like increasing your cardio and using with weight lifting. STABILITY BALL. What a wonderful invention. It’s super inexpensive (can find for $6) and very effective. You can do push-ups off this, use it as a bench for chest exercises, do sit-ups, strengthen your back, use for balance, and incorporate with your cardio workouts. That’s a long list. YOGA BANDS. 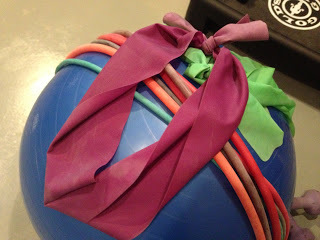 Tie these together and you’ve got an intense lower body workout plus they’re great for physical therapy if you are working through an injury or just had a surgery with your knees. With the DVD’s I listed you could do a different workout every day for over a year. How’s that for changing things up? The equipment is very minimal (I have other things and these are my favorite but you don’t even need half the stuff I’ve pictured). INVEST yourself and money into finding what you like. I found out that I enjoy kickboxing, plyometrics (using your own bodyweight), and weight lifting the best. I also enjoy biking but it’s not all year with the weather. What about space to workout? I may have a nice workout room in my house but I have never had one before a year ago. I used the living room, office, guest bedroom…you only need a few feet of space! Money. What about money? Some may be reading this and saying, “Well I just don’t have any money to spend on exercise stuff.” Sorry to bust your bubble but at some point you’re going to have to stop saying that and invest. Now I know everyone has rough patches and I COMPLETELY get that. But you have to realize that investing a few dollars into your health will SAVE YOU a ton of money. Don’t take your family out to eat one time and you’ve bought several workouts that you can KEEP. Medical expenses are outrageous. Just to go see the doctor or buy a medication, it’s way more money than a few exercise DVD’s. Christmas is less than a month away. Ask for some workout gear! If you can’t buy anything right now then look up workouts online. You know how many pins there are with great workout tips and ideas? Ever heard of Utube? Tons of workouts you can search for and it’s free. Just don’t get in the trap of never wanting to spend money on tools that you can use the rest of your life. If you do then next thing you know you’re 30 pounds overweight, you didn’t find any fun exercises (now it’s 10 times harder to start exercising), your back hurts, knees hurt, you have a terrible time sleeping, yet you have no energy, you’ve got acid reflux, and you’re going to the doctor for check-ups only to get bad news that you’re borderline diabetic and your cholesterol is too high…..or you could try out new things NOW to find something you enjoy. You may have to go through a season of hating it and pushing through. But it’ll seem so easy and inexpensive when it comes to trying to workout in 10 years because your doctor gives you an ultimatum and you’ve been buying all those new clothes to fit into your larger shape plus added tests/medications for the problems that developed. Sooo….off the soapbox now. Seriously, exercise can be fun. Ask around for workout classes. Find out if you like working out by yourself, with a friend, or with a group. Try a variety of classes. Don’t just default to cardio. There are so many options and so many ways to do it without spending a bunch of money. I encourage you to find what works for you!